3. What is EDMX file in Entity Framework? EDMX(Entity Data Model XML) file is a XML file that defines the CSDL, MSL and SSDL definitions. It means it contains the definition of storage model, Conceptual model and mapping between this two. 4. What are CSDL, SSDL and MSL sections in an EDMX file? If you see the EDMX you will find there is separate Nodes for each Section as below, which is auto generated by system only. 5. What is defining query in Entity framework. A defining query will allow you to execute a SQL statement that is specified in the DefiningQuery element of an .edmx file. 6. What is association set in Entity Framework? Association shows the logical relation between the tables in EDMX file. 7. How to add and update the EDMX file? 8. 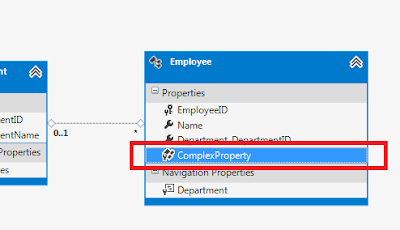 What is PropertyRef in entity framework? PropertyRef element is in Storage schema definition language (SSDL) of EDMX file. It generally used to define the entity key. It used to define the identity columns for your table column. 9. Difference between LINQ to SQL and Entity Framework? It create DBML file to work. It work for any type of data base, SQL Server, DB2, My SQL etc. It works for only SQL server database. It enables to query using data using DataContext. 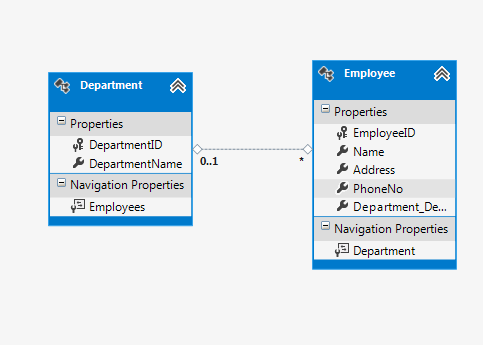 Entity Framework you can map class with multiple tables. Classes must be one-to-one with database object with tables. Entity frame work support Model first, DB first and Code first approach. It support only DB first approach. 10. What is T4 Templates and why we need it in entity framework? T4 (Text template transformation toolkit) is template based code generation engine. You can say the T4 template is heart of EDMX file. It generate the C# code behind it’s an entity and context classes. 11. What is Entity Container in entity framework? Entity container is the logical grouping for entity set and association set that will exist in CSDL, which is having unique name. 12. What is POCO class in Entity Framework? 13. What is Data first approach? In database first approach you should have database created with list of tables that you want to store database and with the help of that database you will create your entity framework classes. Follow the below link to know how to create entity framework data first. 14. 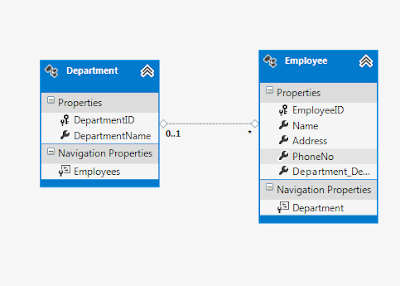 What is Entity Graph in entity framework? 15. What is Code first approach? Follow the below link to see the example of code first approach. 16. What is Model first approach? 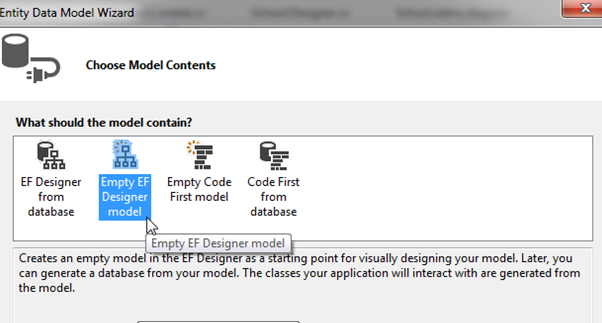 In model first approach you will generate the models by using the visual studio. And create the tables or POCO class with the help of designer instead of your own. 17. Differences between POCO, Model First and data first approach? 1. Database create before generation of code. 2. Automated code generation by visual studio. 3. using of T4 template generate the C# code. 4. No much control over the Code. 1. Database generated from POCO classes. 2. No automated code generation. 3. Fully control over the code. you need to write your own C# Code. 1. Creation of Context and tables using the Designer tool. 2. T4 template will generate the C# code. 3. You have not full control over the code or DB. 4. After creation of tables, once you run application it generate database. 18. How to do add, update, and delete using EF? 19. How can use stored procedures in Entity Framework? There are two way to call the store procedure. Please find the below link to check how to call the store procedure. 20. What are the types of property in Entity Framework? Lazy Loading: Process of loading the related objects until it is required. Eager Loading: Process of loading the related objects is loaded automatically with its parent object. 22. What is lazy loading in Entity Framework? Lazy loading is the concept of loading the data only when we required. We can say it loading on demand. Suppose you have a Department object there you have Employee object also and there is 1 to many relation between Departments to Employee. But when you fetch the records of department it won't load the Employee object but the tome when you are doing the foreach on Department object Employee object not loaded but once you will do the iteration for Employee object than only the Employee object will load. 23. How to disable the lazy loading framework? 24. Can we have Enum in Entity Framework? Yes you can create the Enum in entity framework. 25. What is the difference between DbContext and ObjectContext? ObjectContext : ObjectContext is responsible for all the Database operations data connection, provide add, Update and delete function. DbContext : it is Wrapper for ObjectContext and provide the lightweight alternative for object context. It is useful in Database First, Model First approach as well as Code First approach. ObjectContext class is not thread-safe. ObjectContext used by Entity Framework 4.0 and below. ObjectContext used by Entity Framework 4.1 and above. DbContext does not support Compiled Queries. 26. How to handle concurrency in Entity Framework. you should get an OptimisticConcurrencyException error. 27. What is client wins and store wins mode in Entity Framework concurrency? 28. What are scalar and navigation properties in Entity Framework? 29. 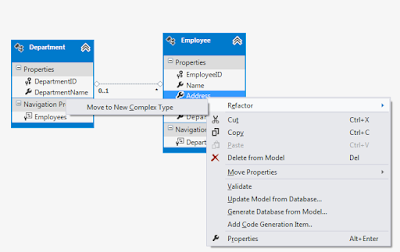 What are complex types in Entity Framework? There is a situation when we need to use the common property in many tables. To make and to work with the common property we make it as Complex property. Like in Below Screen we make Address and Phone Number as Complex Property. Now the complex property will display like. 30. Entity framework performance tips. There are list of item which will help to improve the Entity Frame work performance like. a. Using of projection query : Instead of fetching all the records from the database, fetch only those which is required. e.g. If you have customer object and you want UserName, Password and Phone Number so Query it like. b. Disable Change Tracking if not required : Suppose if you are fetching the records to view not for any modification purpose so you can disable object tracking from merge Option. Like below code. c. Pre-Generating Views to reduce response time for first request : If there are huge database and creating lot of view to show the records, view are C# code which is interacting with the database to load. If generating all the view in one instance and in first call, than performance will degrade to avoid it use T4 template and EdmGen.exe command-line tool. d. Use Index : Make sure you have added Indexes to entities. You can add the index to entities when using the code first by calling CreateIndex. e. Use Compiled Query : Use Compiled query if you are hitting the database frequently. It Reduce the turnaround time.